Brambles (genus Rubus) may be native but they are generally undesirable in a prairie or savanna. This post is based on over 20 years of restoration work at Pleasant Valley Conservancy. The story starts when Kathie and I first started clearing invasive brush and trees from prairie and savanna remnants at PVC in 1997. 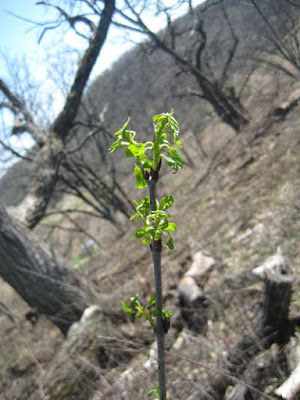 There was lots of bad stuff: shrubs such as buckthorn, honeysuckle, and prickly ash and trees such as elm, cedar, red pine (planted), box elder. If there were brambles, we did not notice them. Probably they were shade-suppressed. But once the site was opened up, brambles started to flourish. Originally they were just small patches, which in our ignorance we ignored. In 1999 some of these bramble patches were large enough that we got rid of them. There may have been some larger patches, but in a property as large as Pleasant Valley Conservancy, it was easy to overlook them. Brambles are members of the genus Rubus. They have perennial roots systems but biennial tops. The roots continue to spread but new canes are formed each year. The first year cane just grows vegetatively and in the second year flowers and forms fruits. After fruit formation it dies. Thus, a bramble patch is a mixture of first year and second year canes, as well as dead canes which senesce. 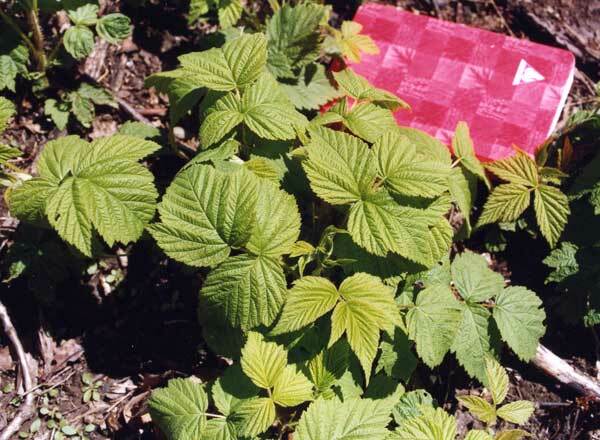 We have three species of Rubus at PVC: blackberries, black raspberries, red raspberries. All are bad, and we do not distinguish between them, although red raspberries presents a special challenge. It was 2005 before brambles started to be so obvious that we could not ignore them. That year I made a survey, marking each patch with a numbered stake. There were 17 patches, all in open savannas. My notes in the table here give some idea of how large these bramble patches were. This is a two-three person job! At that time the only information I could find about how to eradicate brambles was: Mowing several times a year will reduce their vigor. Reducing vigor did not sound like a promising method for eradication. 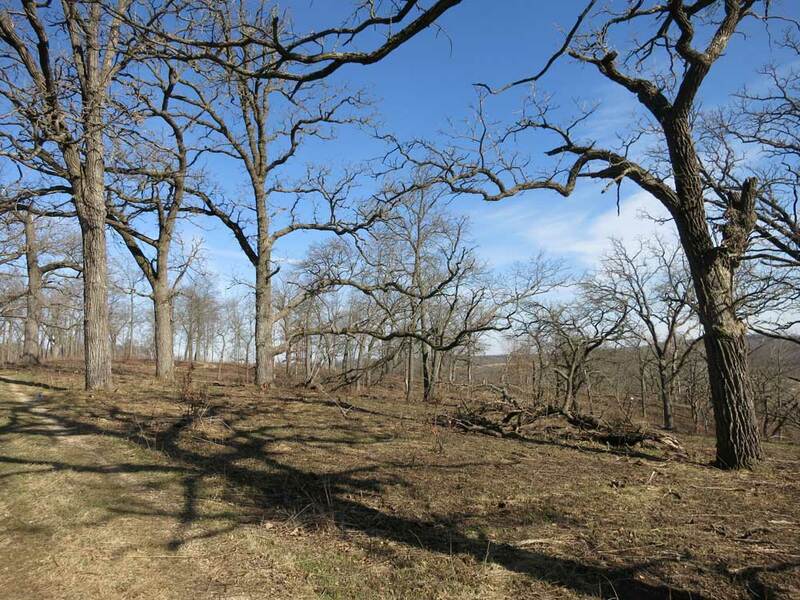 By the late fall of 2005 Kathie and I had decided that our goal should be to get rid of all brambles, as well as other invasive brush that had sprung up in our restored areas. After all, we had spent a lot of effort opening up these prairies and savanna. If we did not get rid of all these new invaders, we could be back where we started. An awful thought! We experimented with several different methods of herbicide application: foliar spraying the bramble patches (low herbicide concentration); basal bark (high concentration, in oil); cut and treat the cut stems (high concentration, either aqueous of in oil). We rejected foliar spraying of the large patches because of the possible peripheral herbicide damage. We tried basal bark, but application from a backpack sprayer was also “wasterful” of herbicide, and because of the high concentration, there were bare zones around the treated patches. We also tried a sponge method for basal bark, but the thorns on the brambles tore the sponges to shreds. We chose the “cut-and-treat” method because only small amounts of herbicide would be used, and it could be applied carefully by a spray bottle. Because of the extent of the infestations, this was usually a four- to five-person job. 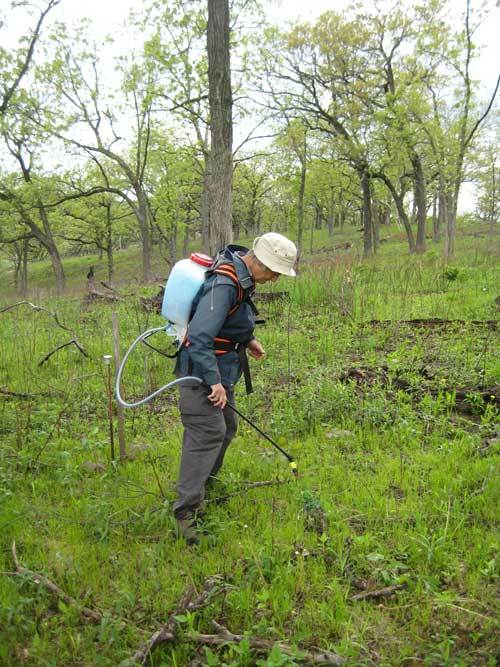 One person operated the Stihl brush cutter and the others followed along with spray bottles containing 50% glyphosate. Since we were working primarily in the winter, when it was below freezing we diluted the glyphosate with windshield washer fluid. Where there was a lot of buckthorn, we used Garlon 4 in oil, which presented no freezing problem in the winter. The “treaters” fanned out behind the brush cutter and treated each cut stem. A great advantage of this method is that it could be done any time of year, and especially at times when weed work, plant surveys, seed collecting, etc. could not be done. We worked with a combination of hired employees and volunteers. I ran some preliminary versions of this method in late November 2005. 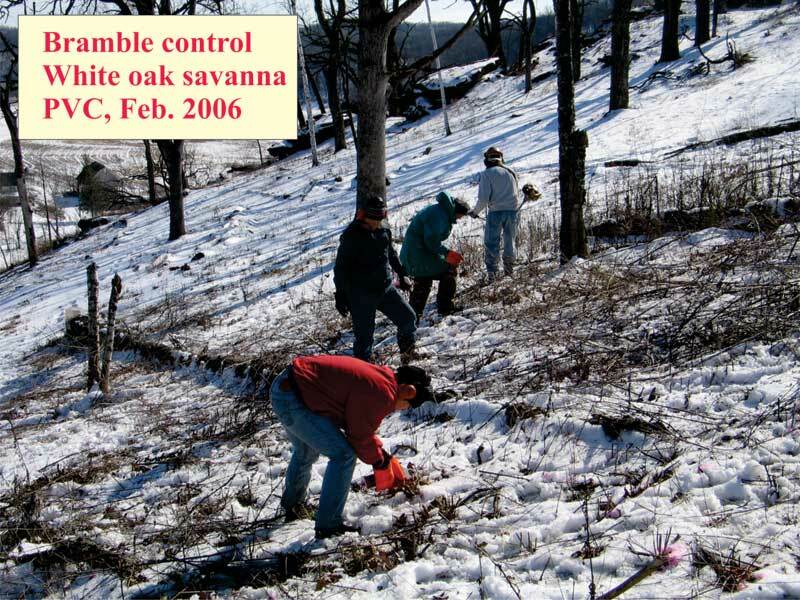 We then set up a major effort on the White Oak Savanna starting in early January 2006. Todd Shumate from Michler & Brown ran the brush cutter and three or four “treaters” followed behind. Todd cut every woody shrub in the savanna. Brambles constituted at least half of the brush, but honeysuckle and prickly ash were substantial. The table gives an example of this work for a five-acre white oak savanna. Finishing the whole unit took 9 days, working about 40 person hours per acre. Fortunately, January of 2006 was surprisingly mild and snow-free. Often we were in shirt sleeves at noon. In 2007 I established winter intern positions, and we had 3 (or 4) UW-Madison students working two days a week starting in January and continuing until mid May. lots of honeys on Unit 9; walnuts; Autumn olive! Ravine between 12A and 20B; lots of snow drifts! Corner PV Rd & Cty F; snow deep! Above Unit 1 and along Ridge Trail; FINISH WHOLE SOUTH SLOPE!! Brambles are fairly fire sensitive and are killed by a controlled burn. 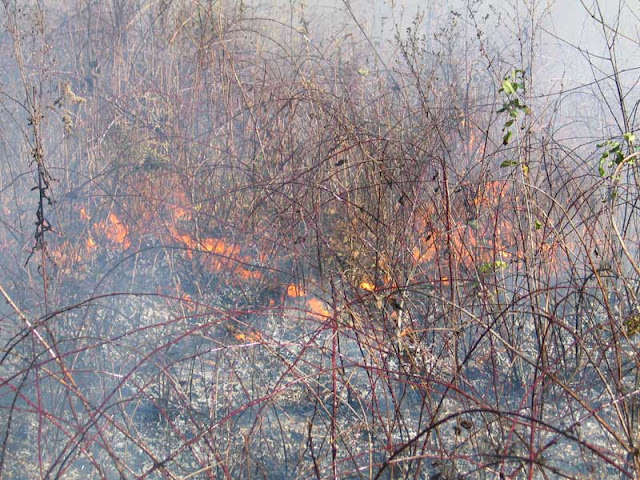 Fire moving through a bramble patch in a savanna. All bramble stems are killed. Starting in 2008 we added another method of bramble control: foliar spraying of resprouts after the bramble canes had been killed by early spring burns. The details of this method are covered in several Tom’s Blog posts in 2008, 2009, and 2010. After a burn, bramble patches are fairly easy to spot, as the following photo shows. Table used to create an ArcGIS map of brambles. The date burned was used to determine which units to spray first. Near saddle road; may have been sprayed? Very large clone between saddle road and Mid Sav Trail; all day job for 1 person!! By the beginning of 2010 we had fairly good control of brambles except for red raspberry, which forms really dense patches of brambles with stems growing very close together. The cut-and -treat method is not recommended because the cut stems are so close together and it is difficult to keep track of which ones had been treated. Fortunately, most of the areas where we were cutting and treating did not have red raspberries. After almost ten years working on bramble control, I found that the best way to control red raspberry is to spray (with 3.5% aqueous Garlon 3A) all the resprouts that arise after burns. However, not all shoots come up at the same time, so it is necessary to spray again two weeks after the first time, and again after another two weeks. Monitoring again in mid-summer for any “escapes”, and again the next year is also advisable. 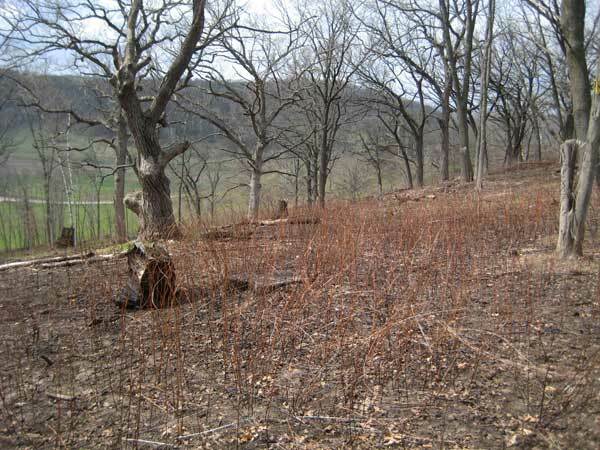 One of the most important reasons why annual burns should be done in oak savannas is because of brambles. 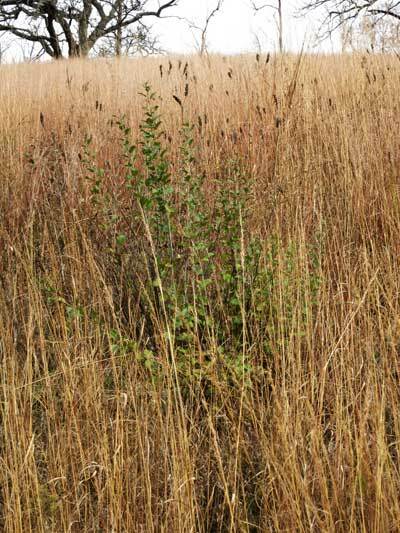 Putting savannas on a three-year burn cycle, such as is often done for prairies, is exceedingly ill advised. Savannas almost always have a “legacy” of woody invasives, of which brambles are one of the most important. 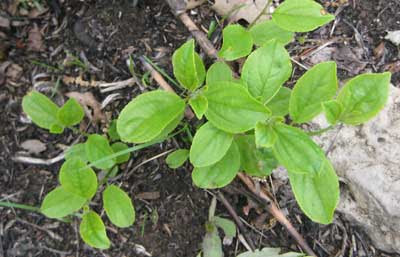 Giving woody vegetation the chance to grow unimpeded for three years does serious damage to the herbaceous understory. In addition, the savanna will not carry a fire well with all those woody shrubs hogging the savanna floor. We have been burning our savannas annually for 15 years (since 2002). The best time to search for undesirable woody plants is after a burn. This photo, of the Unit 10 savanna, was taken on March 28, 2017 (the spring burn had been done on Feb 22, 2017). Note the absence of woody vegetation (except for the blow-downs). You could walk from one end of this savanna to the other without encountering a single obstacle. Compare with the 2008 photo shown above.